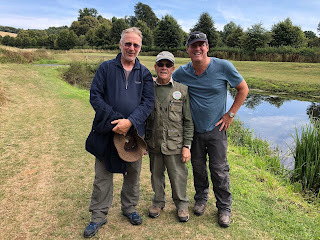 The first match of the new Farnham Angling Society season today at Kings Pond on the Badshot Lea complex, for me anyway. 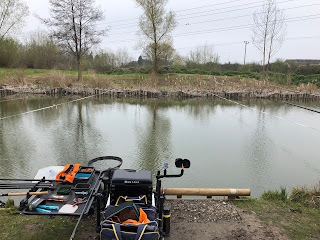 The weather over the weekend was mixed with a cold snap and over cast weather on the Sunday so I felt it would be a more negative feeding approach than positive. 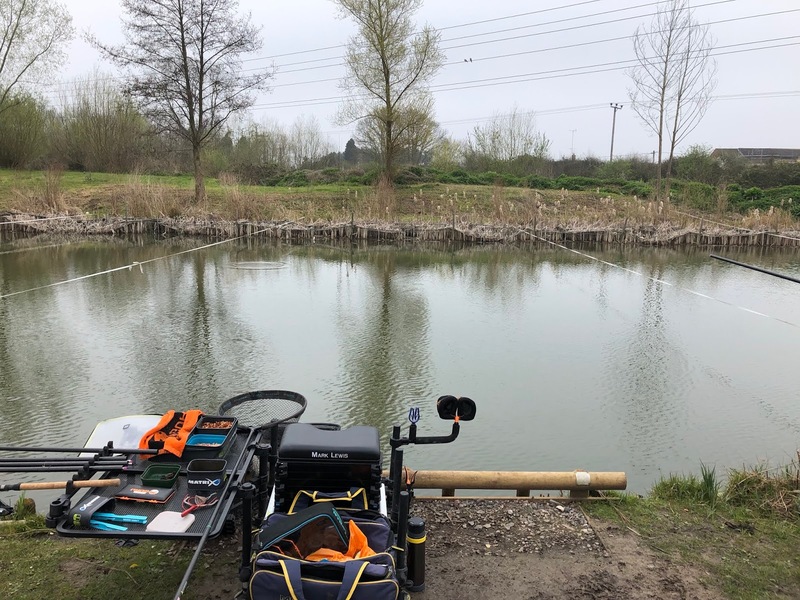 It was a full house at Kings Pond today, 16 pegs, 16 competitors… the draw was most orderly too. Richard Cain calling out the members in the order they had booking onto the match. I was fourteenth to draw and peg 13 came out for me. For note, the first time I fished here I was on peg 12! The far bank was calling, however the choice would be waggler or feed/bomb. I decided to set-up a small feeder and clipped up to fish as close to the protective fence as I dare. Bait was the natural approach, maggots, casters, some worms, sweetcorn and a dark sweet fishmeal groundbait. I pumped some expander pellets too, just in case. We had plenty of time to set-up with the 9am draw, fishing from 11am until 4pm. The all in was called via a good old fashioned whistle. With the negative / positive approach I put a ball of groundbait on the right hand lines and a nugget on the left lines. The balls contained loose offerings, the nuggets, simply groundbait. Out on the feeder, that would be cast every 2-3 minutes in the first hour. Initially baiting with double dead red maggot and a long hooklength. The first cast, the tip was rattling however I missed the fish, second cast a lovely rudd in the net. 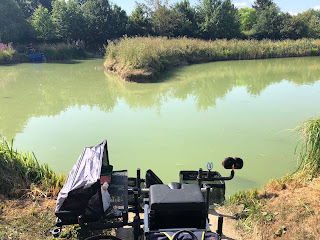 Next cast a larger fish that felt like a tench however it snagged me in the sunken lily pads, after slackening the line to let the fish try to pull the line free, it disconnected and I was left with my rig intact. That would be the end of the action for sometime! With the first hour past and very little to show for it, the long pole lines where the next option. 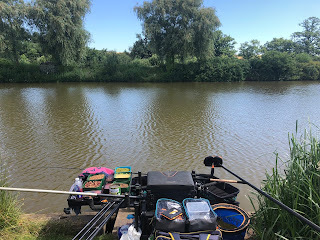 First over the line that had been fed with a nugget of groundbait, a quick bite and roach in the net, followed by… nothing… checking the more positive line nothing either, so a quick top up of both lines and back to the feeder. I started to vary the time I would leave the feeder in situ, shortening the hooklength and varying the baits. Finally I struck on what appeared to be the correct combination… worms! The bites were pretty savage and soon the culprit would reveal itself to be a small tench. Three small tench followed each other to the net which piqued Nobby’s interest next door in peg 14 who wandered over and grabbed a couple of worms from me. I’d been dripping the top 2 and two lines with casters all match so had a look over both lines with nothing coming from it. Back to the long pole lines and a switch to double caster put me back in touch with the fish. With 15 minutes to run I hooked a final tench, the largest of the match for me and the all-out was called. 3lb 12oz for section 3rd, pipping Nobby next door to me. Well done to Tommy for grabbing the win from peg 16 and Terry who took 2nd in section from peg 14. The lake fished extremely hard with the top weights in both section being around 8lb including a few DNW’s! Was it due to the lake being full and also the colder weather? 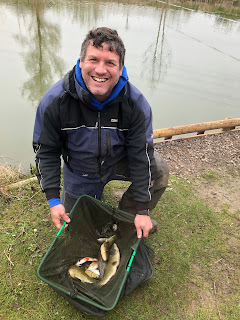 One thing was for sure that the fish seemed to be in certain areas and that the negative approach was the way forward with the worms working on the feeder line and double caster shorting out the fish on the long pole lines, lifting and dropping the bait working best for me.